I’ve still got a little bit of a cold so when I watched this video I was immediately overcome by a coughing attack and missed part of it. So I had to watch it again. And then I coughed again. But it was totally worth it – it’s just that funny. Snoop Dogg made a little visit to Martha Stewart on her show and the two of them decided to make brownies. 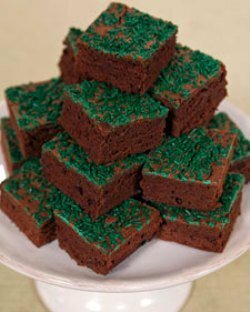 Green brownies. That’s when things got fun. Between all the innuendos and joking back and forth, Martha Stewart and Snoop Dogg did some freestyle rapping. Yup, Martha Stewart rapped. Sort of. You know, I think Martha Stewart is one of those uncover cool old ladies. She’s all ginger snaps and Christmas sweaters on the outside but on the inside she’s leather and spice. I found the recipe for the green brownies Snoop Dogg and Martha Stewart made. Yummm…..add your own special ingredient at home. Preheat oven to 350 degrees. Butter a 13-by-9-inch baking sheet. Line baking sheet with parchment paper, leaving a 1-inch overhang on the two long sides. Set aside. Place butter and chocolate in a large heatproof bowl set over (but not touching) simmering water; stir frequently until chocolate and butter are melted, about 7 minutes. Remove bowl from heat; let cool to room temperature, 10 to 15 minutes. Pour batter into prepared pan, and smooth top with an offset spatula; scatter green sprinkles over top. Bake until a cake tester inserted in the center comes out with only a few moist crumbs attached, 40 to 45 minutes. Transfer pan to a wire rack to cool completely. Run a knife or offset spatula around the edges of the pan. Using parchment paper, lift brownies out of pan and onto the rack. Transfer to a cutting board; cut into 2-inch squares. Brownies can be kept in an airtight container at room temperature for up to 3 days. 50 queries in 1.727 seconds.